A New Play is Born! 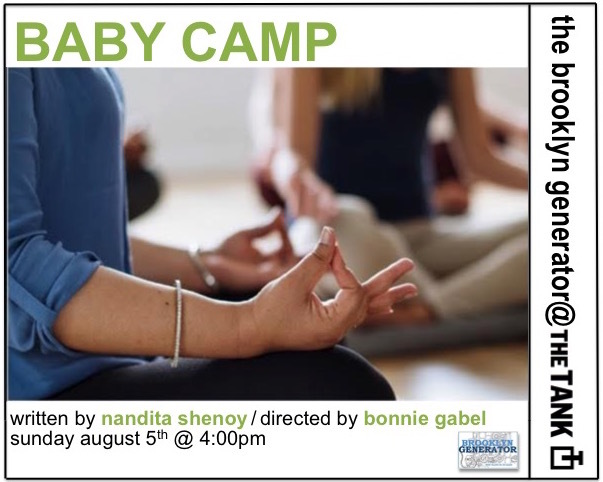 Yesterday marked the birth of a new play in the world: my latest written-in-a-month full-length play "Baby Camp" written under the auspices of the Brooklyn Generator. Featuring the wonderful acting talents of Geneva Carr, Tina Chillip, and Maria-Isabella Rojas and led by our fearless director, Bonnie Gabel, this play started its journey at the Tank yesterday in a reading for a full house. This is my second time working with the Brooklyn Generator, a playwriting group that selects 6 playwrights to write the first draft of a new play in one month, and although the initial process of writing is always very painful to me, I am so filled with gratitude to Bixby Elliot and Erin Mallon for inviting me back and forcing me to write a play. And in retrospect, the painful part of playwriting winds up getting compacted into one month instead of dragging out for many which has definitely been the case for a few of my other works. In any case, I am ruled by deadlines, and this deadline certainly whipped me into shape! "Baby Camp" spends a week at a feminine empowerment retreat with four progressive women (the fourth was played by me!) who find themselves being encouraged to reproduce in a most unsettling manner. The play touched on a lot of women's issues that have been on my mind since the election, and it was a joy to put all my existential dread into a comedy. Nandita Shenoy is an actor-writer living in New York City who believes in the power of laughter, fabulous shoes, and bacon to right any wrong.